The Chinese Taipei Olympic Committee has awarded the 2014 International Olympic Committee (IOC) Sport and Art Trophy to the renowned sculptor Professor Pu Hao-Ming. Chinese Taipei Olympic Committee President Hong-Dow Lin presented the Trophy to Pu in recognition of his outstanding contribution and devotion to the development of sport and art in Taiwan in the presence of Tai-Ling Peng, Deputy General Director of Sport Administration of Ministry of Education and an Executive Board members of the National Olympic Committee (NOC). Born in Chiayi City, Taiwan, in 1944, Pu is the son of Pu Tien-sheng, "one of the most influential scupltors in the history of Taiwan art." Pu was nominated by Chinese Taipei NOC for the 2014 IOC Trophy for his continuous devotion and affection for art, and vivacious attention to involve and create his work piece with sport. 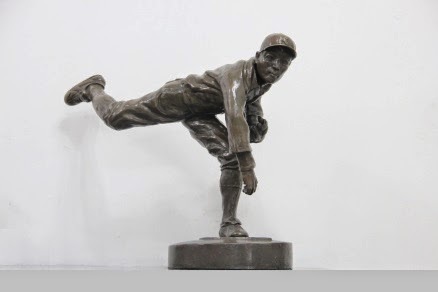 The most celebrated sports work of Pu in 2014 was the statute of a 1931 Kano baseball pitcher Wu Mingjie, "KANO1931. An Eagle Spreading Its Wings", which is now exhibited in Chiayi City centre. About 60,000 people attended the parade for the unveiling ceremony of the statue and the premiere of the baseball movie "KANO". A miniature version of the Wu statue was later collected by Japan Koshien Baseball History Museum and Tokyo Palace Museum.